Multiple conservative groups rebelled right out of the gate to Senator John McCain’s announcement that he will indeed seek re-election in what is expected to be a historic 2016 election cycle. Within hours of McCain’s announcement both Conservative Review and the Senate Conservatives Fund had emailed to rally supporters against McCain. The messages pointed out McCain’s record and weakened position. Senate Conservatives Fund called for a strong show of support to oust a weakened McCain and elect a fresh face to represent Arizona in the U.S. Senate. Both messages criticize McCain for his part in the “Gang of Eight” immigration reform and his support for amnesty, his vote for the taxpayer funded “Wall Street” bailout, his vote to fund implementation of Obamacare and criticism of efforts to halt that funding, opposition to a $1.3 trillion tax cut, support for a $600 billion tax hike, repeated votes to raise the debt limit and voting against term limits. Senate Conservatives Fund is asking those supportive of a McCain alternative to put their money where their mouth is with a financial contribution and signature on their “Replace John McCain” in 2016 petition. The grass roots, urges the letter, “is asking for our help,” citing polling that says 98 percent want a conservative alternative to McCain. According to FEC records, the Friends of John McCain campaign committee held $2 million in cash on hand at the end of 2014. Almost $1.2 million of that came from 2008 presidential campaign committee funds transferred in 2013, in addition to $1.3 million in individual contributions. 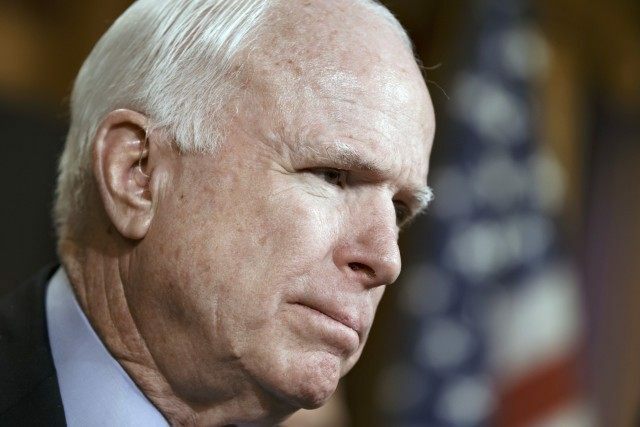 It comes as no surprise that the National Republican Senatorial Committee is supportive of McCain as the “Friends of John McCain” committee transferred $265,000 to the National Republican Senatorial Committee in 2014 and late 2013.